Pakistan's busiest international airport came under fresh attack by gunmen, less than two days after a team of Taliban militants launched an assault that killed 26 people and destroyed buildings. 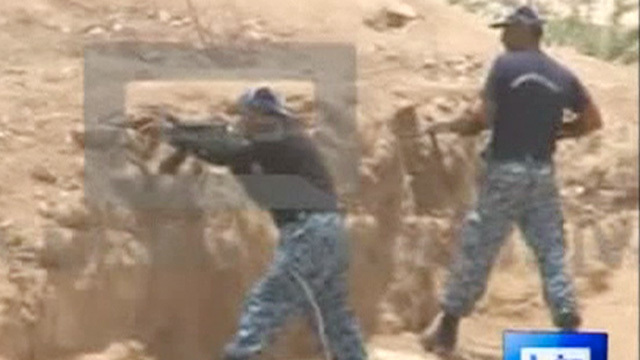 Flights in and out of Karachi's Jinnah international airport were immediately suspended on Tuesday afternoon when gunmen attacked the entrance of a training base used by the Airports Security Force (ASF), located just outside the airfield's northern perimeter. Television pictures showed soldiers and ASF forces taking positions in an open area of scrubland that separates the airport from Pehelwan Goth, a notorious slum that police have long claimed is a haven for terrorists. The firefight lasted less than two hours on the northern side of the airport, opposite the terminal buildings and hangers that were attacked on Sunday by an assault team of Pakistani Taliban militants. An ASF spokesman said there had been an exchange of fire at a checkpoint guarding the airport and no one was reported hurt or killed. The assault came as the army launched air strikes in the country's troubled north-west, killing 15 people and destroying nine terrorist hideouts, according to an official statement. 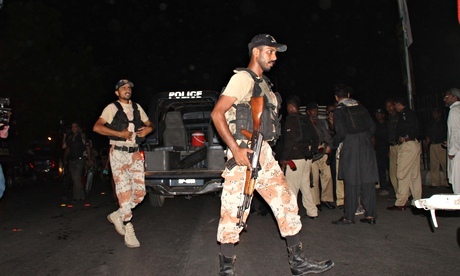 Speculation is growing that the Sunday night attack on Karachi's airportwill prompt Pakistan to launch a major operation to dislodge militants from North Waziristan, an area bordering Afghanistan that has become a sanctuary for a host of terrorist groups. Also on Tuesday, airport authorities found an additional seven dead bodies in one of the burned out buildings that was attacked on Sunday, bringing the death toll to a total of 36, including the 10 Taliban attackers.